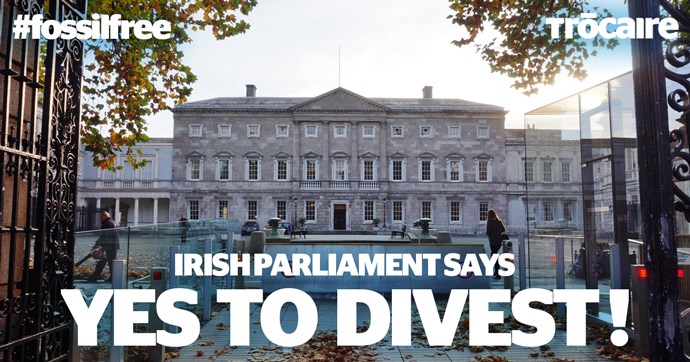 Deputy Pringle’s Bill will make Ireland the first country in the world to remove public money from investments in fossil fuel corporations, responsible for over 70% of global CO2 emissions. The Bill received its final vote today [Thursday Dec 6th) in the Dáil and will now go to President Higgins to be signed and enacted into law. Senators in the Seanad last week passed the Bill with unanimous support after the Bill passed all stages of the Dáil in July. Speaking on the passing of his Bill Independent TD for Donegal, Thomas Pringle says “this is a momentous Bill as it makes Ireland the first country in the world to divest its public money from fossil fuel companies. That means a lot for a small country like Ireland and one which hopes to lead on climate action in the future. “Much international attention has been paid to this Bill revealing both its symbolic nature and the level of ambition that it sets out in getting the Government to take climate change seriously. The Bill has taken me to conferences in Rome and San Francisco and continues to garner interest from the international community.